A collection of inspirational C.S. Lewis quotes for your enjoyment. Clive Staples Lewis was born in Belfast, N. Ireland in 1898. 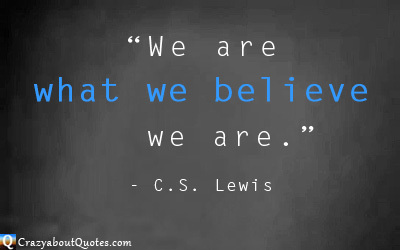 Whilst best known for The Chronicles of Narnia series of children's books, first of which was the much loved The Lion, the Witch and the Wardrobe, he was also a respected scholar and writer of Christian literature . For nearly two decades Lewis met with friends, which included J.R.R. Tolkien, in Oxford every week to discuss literature and life. This meeting of fine minds was most definitely a contributing factor in Lewis' and other members of the groups success. Tolkien was also a major influence in C.S. Lewis' conversion from atheism to Christianity. but the form of every virtue at the testing point." "Aim at heaven and you will get earth thrown in. Aim at earth and you get neither." whatever solid and durable happiness there is in our lives." but they are afflictions, not sins. our share in the passion of Christ." "Experience: that most brutal of teachers. But you learn, my God do you learn." Dark would be without meaning." There are better things ahead than any we leave behind."